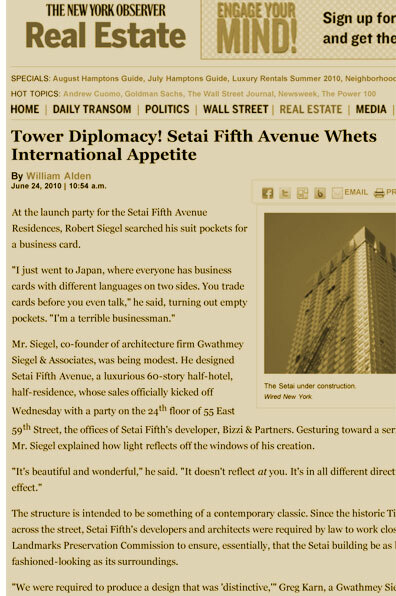 At the launch party for the Setai Fifth Avenue Residences, Robert Siegel searched his suit pockets for a business card. Mr. Siegel, co-founder of architecture firm Gwathmey Siegel Kaufman Architects, was being modest. He designed Setai Fifth Avenue, a luxurious 60-story half-hotel, half-residence, whose sales officially kicked off Wednesday with a party on the 24th floor of 55 East 59th Street, the offices of Setai Fifth’s developer, Bizzi & Partners. Gesturing toward a series of poster boards, Mr. Siegel explained how light reflects off the windows of his creation.